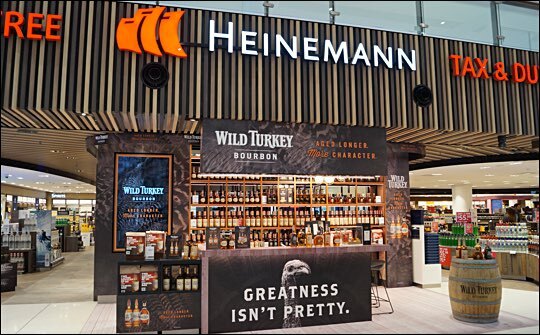 Gruppo Campari Global Travel Retail has partnered with Heinemann at its flagship Sydney Airport store in a one-month campaign for Wild Turkey Kentucky Straight Bourbon. Wild Turkey is the number one premium Bourbon by volume in Australia (IWSR 2015) and Australia is one of the key contributing markets of the brand’s +8.8% organic growth in 2015. Prominently located at the Tavern Tasting Bar, front of store, in an area of high passenger footfall, the activation features several key products within the Wild Turkey portfolio. Branded light boxes, feature wall panels and back-lit shelving provide a strong presence for the introduction of the new limited release Wild Turkey Master’s Keep 17 Year Old alongside six core variants from the brand portfolio: Wild Turkey 101 Proof, Wild Turkey 86.8 Proof, Wild Turkey Rare Breed and Wild Turkey Kentucky Spirit and two flavor variants: Wild Turkey American Honey Liqueur and Wild Turkey Spiced. Wild Turkey Master’s Keep 17 year old celebrates is the inaugural release from master distiller Eddie Russell who is following in the footsteps of his legendary father Jimmy Russell. The only active father son master distiller team in the world. The whisky is been aged in both brick and wood rickhouses. The consistent temperatures in the brick rickhouses give the bourbon a mild, earthy flavour profile, while the greater temperature variations in the wood rickhouses allows the liquid to absorb more of the vanilla, caramel and oak flavours from the oak barrels. Although Master’s Keep went in to the barrel at 107 proof, its unique ageing process produces a lower bottle proof of 86.8. The liquid starts out smooth and silky, transforming into a caramel, vanilla sweetness and finishes with savory spiciness and oak.